The best thing about this lengthy lumbering but never uninteresting odeto anti-terrorism is the lovely wizened Waheeda Rehman. But we have to wait till after interval point for her to show up. In the sequel our hero Wisam Kashmiri (no room for subtlety here) is still being sneered at by his colleague Anant Mahdevan at RAW. 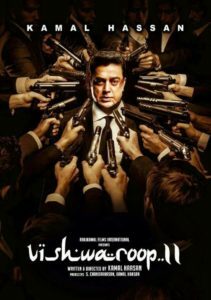 Kamal Haasn being Kamal Haasan sneers right back with the kind of taunting rhetoric that sounds a little phoney when translated from the Tamil original. But his two heroines clap and cheer the performance. Throughout its ruminative running-time Vishwaroopam 2 moves a little off-beam. It is somewhat breathless and out of sorts in parts specially when all the espionage stuff with Shekhkar Kapoor (looking suave still at 70), Anant Mahdevan and, of all people Rajendra Gupta (who as a RAW boss seems…well, a little raw) comes to a standstill, while Kamal Haasan playing a RAW double-agent banters, flirts and romances with his female associates played by Pooja Kumar and Andrea Jeremiah. Is he sleeping with both or only the one who is Mr Kashmiri’s legally wedded wife. As we are told, he is not very good with societal rules. It is hard to say which of the two our hero Wisam is married to. He behaves exactly the same way with both. The antics of the ménage a trois somehow never achieve any of the seductive peaks they are meant to hit. Perhaps the flirty dialogues lose their edge in translation. Both the ladies are annoying in their servitude and thralldom to the Kamal Haasan School Of Hero Worship. What gives this sequel its spin and spell are the bouts of action shot with the dizzying urgency one witnesses in the war zone. There are two lengthy fights in public restrooms, a la Mission Impossible Fallout. But let’s not even go there.As long as we don’t compare the action sequences with their firangi counterparts things appear pretty engaging in Vishwaroopam. This is not a dumbed-down militancy movie. Yes, this is a learned view of terrorism filled with sly references to Obama and 9/11. The unintiated may find the narrative hard to keep up with. As Kamal Haasan if he cares. But those who enjoy watching a good wack on the back of militancy, Vishwaroopam 2 is an engaging if somewhat choppy ride through the terror terrain.